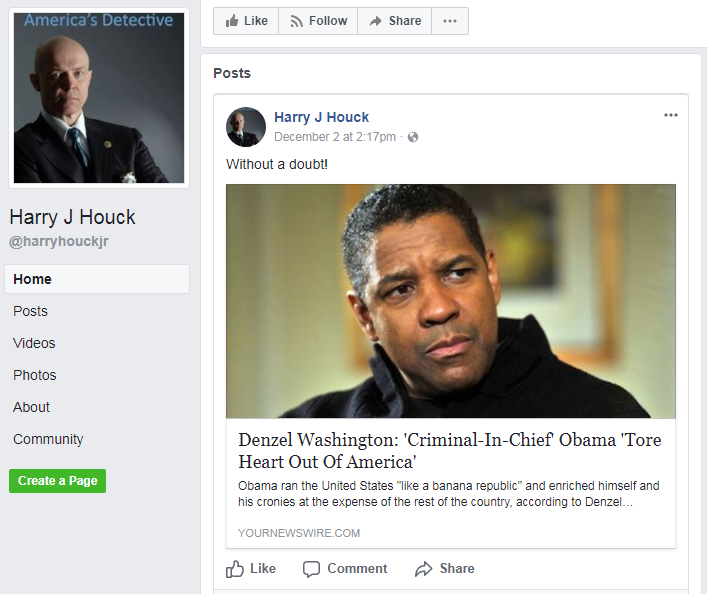 UPDATE (2/26): Houck wrote on Facebook that he will no longer be "affiliated with CNN" as of February 28 and said he "will continue to back our police officers on other networks if they allow me and to escalate our fight against the dangerous progressive democrats who wish to diminish our constitutional rights as Americans." Harry Houck no longer works for CNN as a law enforcement analyst, according to his recently updated LinkedIn profile. The apparent departure is good news for CNN viewers: Houck has been an apologist for police brutality and pushed racist tropes about black criminality. Houck recently changed his LinkedIn profile to state that he is now a “Former CNN Law Enforcement Analyst" who worked for the network from May 2015 to February 2018. CNN did not immediately respond to a request for comment. 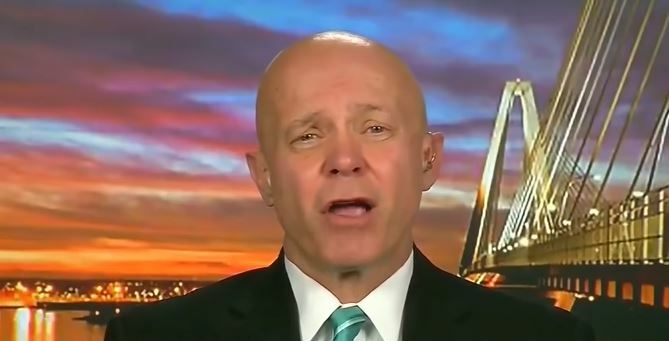 Since being hired as CNN’s law enforcement analyst in May 2015, Houck has used his national platform to defend police officers accused of violence and other misconduct by peddling racist tropes about black criminality, demonizing the Black Lives Matter movement, and blaming black victims of police violence. Houck appeared on CNN 204 times between May 18, 2015, and August 1, 2016. 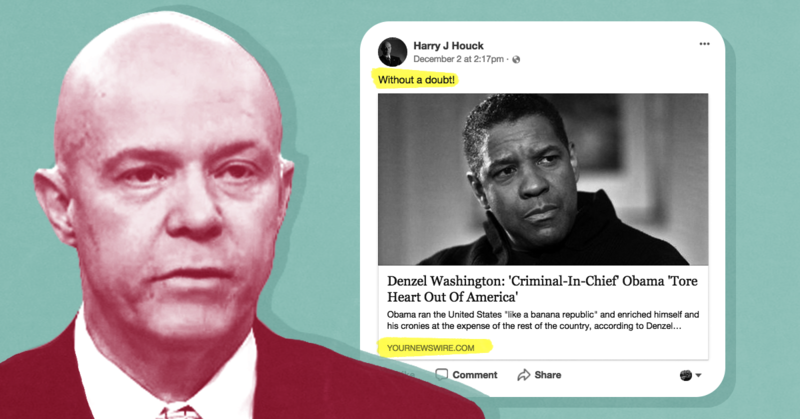 And while he’s often invited to discuss crime stories like active shooter situations, Houck is best known for his absurd defenses of police officers accused of mistreating African-Americans. In dozens of segments, Houck has found ways to blame black victims of police violence, deny the existence of racial profiling in law enforcement, and peddle racist tropes about black criminality. The racial justice organization Color of Change had called for the network to fire Houck, writing that his "blind support of police abuse and reinforcement of racist stereotypes is dangerous." Houck is a retired detective who now works as a CNN law enforcement analyst. He has a long history of race-baiting commentary and regularly blames the victims of police brutality. He also uses his CNN platform to peddle racist tropes about black criminality. YourNewsWire is a fake news website that posts made-up stories and fabricates quotes. Houck’s employer CNN has reported that the site isn’t reputable: Media reporter Brian Stelter wrote last year that the “dubious site … publishes a mix of true, slanted and made-up news.” Analysts have criticized YourNewsWire for being used as a proxy by Russians for spreading disinformation. The fake Denzel Washington story has been shared over 48,000 times combined on Facebook, Linkedin, and Twitter so far, according to the social media analytics website BuzzSumo. Fake news websites spread made-up stories about Washington switching his support to Donald Trump last year. Seeing many reports by individuals that Antifa & BLM started the violence & police were told to stand down by the Mayor of Charlottesville?? Haters on both the far left and far right invaded what was supposed to be a peaceful demonstration in VA yesterday. This has to stop! If you didn't see Trumps press conference just now u gotta see it. He was amazing!!! Go Trump!!!! Nobody has embraced and promoted racism and hate more than the democrats! Media Matters has documented that Houck has a long history of race-baiting commentary, which includes frequently blaming victims of police brutality and describing Black Lives Matter as a “thug group.” He also regularly uses his national platform on CNN to peddle racist tropes about black criminality. He recently claimed that President Donald Trump encouraging police brutality is not "that big a deal." "Where Is The Crime? African American Neighborhoods. Hispanic Neighborhoods." Houck also downplays the reality of racial profiling in the criminal justice system, calling it “something that somebody made up.” He regularly dismisses evidence showing unequal treatment for minorities in the criminal justice system, mocking comprehensive studies and academic research showing that African-Americans are disproportionately targeted by law enforcement. In Houck’s view, African-Americans are targeted by law enforcement because they’re the ones committing crime. Houck’s victim-blaming often leads him to make blatantly false statements about these incidents on national television, like falsely claiming Bland refused to identify herself to police, and falsely claiming an officer informed a pregnant California woman she was being arrested before attempting to arrest her. Racist statements like this drive the attitudes and stereotypes that lead police officers to regularly commit brutal acts of violence that result in Black people like Alton Sterling and Philando Sterling being killed. 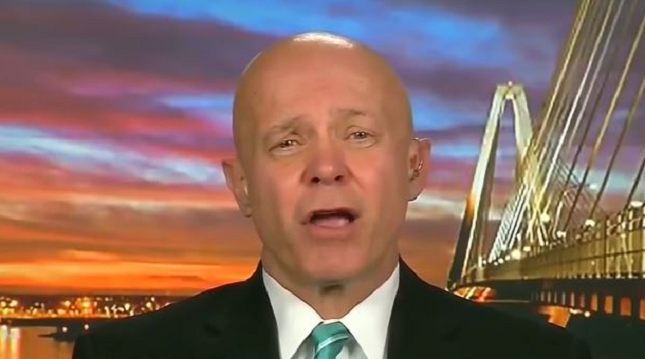 We are sick of CNN contributor and ex-NYPD detective Harry Houck’s one-man crusade against Black victims of law enforcement violence. Houck’s blind support of police abuse and reinforcement of racist stereotypes is dangerous. Media Matters used iQ media and Nexis to search CNN transcripts for the name “Houck” between May 18, 2015 -- Houck’s first appearance as a network “law enforcement analyst” -- and August 1, 2016. Reruns and snippets from pre-recorded interviews were excluded. For blocks of ongoing coverage of active shooter situations, segments were counted only when the host would begin by introducing and identifying Houck for the audience. Top image created by Sarah Wasko. CNN law enforcement analyst Harry Houck promoted a video that calls for President Obama to “ban niggas” in order to reduce violent crime, continuing Houck’s long history of peddling racist tropes about the African-American community. Houck has used his platform on CNN to repeatedly suggest that African-Americans are prone to criminality and to blame black victims of police violence. Houck on Twitter has often warned about “black thugs,” referred to Black Lives Matter as a “thug group,” and even tweeted a link to a white supremacist website. Houck continues to be employed as a law enforcement analyst by CNN. He most recently appeared during the the July 17 edition of CNN’s Reliable Sources, where he attempted to link the shooting of three police officers in Baton Rouge to protests regarding the death of Alton Sterling. CNN frequently hosts Houck in the wake of high profile stories of police brutality and anti-black violence. He is a reliable race-baiter and police apologist, regularly blaming black people for police mistreatment. He has repeatedly suggested that minorities, and specifically black people, commit more crime than white people, and that the solution to the problem of police brutality is for black people to “stop committing crimes.” He’s denied that African-Americans receive different treatment from whites in the criminal justice system, and claimed that any police officer who acts inappropriately is punished for it. Houck’s Twitter presence makes his race-baiting on TV look subtle by comparison. He regularly tweets about the threat posed by “black thugs,” refers to Black Lives Matter as a “thug group,” and decries what he calls “black thug privilage” (sic). Harry Houck has a long record of victim blaming young Black people like Trayvon Martin, Sandra Bland, and now this young Black girl at Spring Valley High School, all while blindly supporting their assailants. It is well passed time CNN dropped Harry Houck from their broadcasts and replace Harry Houck with someone capable of discussing the state of racism and prejudiced policing. Despite his rhetoric, CNN continues to pay Houck as an expert, bringing his race-baiting to a national audience any time a story of over-policing or police brutality makes headlines. Marlee Pittman contributed research to this post. Image by Sarah Wasko.